My seven year old daughter, Hannah loves to play with her dolls and Adora baby dolls have been her beloved favorites. Recently, she has been asking me for a doll that is closer to her own age and we found the perfect fit when browsing the selection available at Adora. The Adora Friends 18” doll collection is exceptional and these dolls are just beautiful. 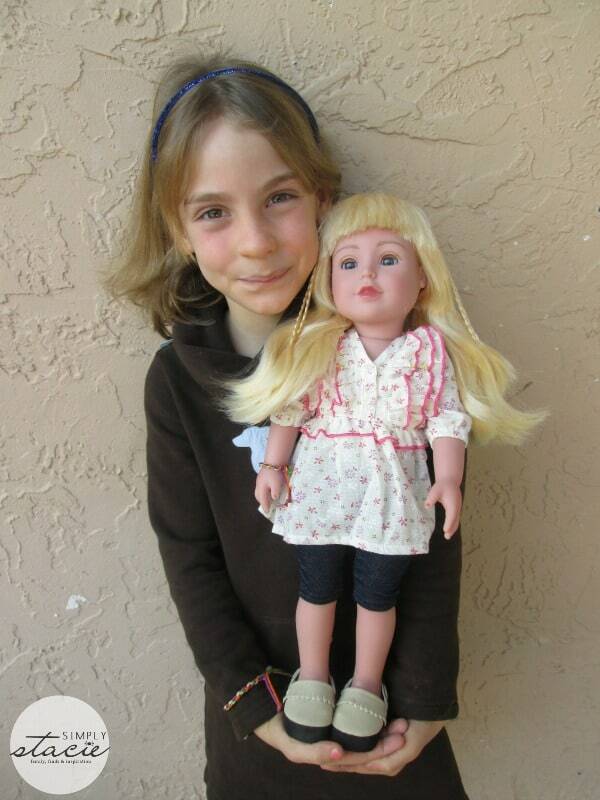 Hannah thought that all of the dolls were pretty but that the Alyssa Friends doll (SRP $69.99) was extra special. 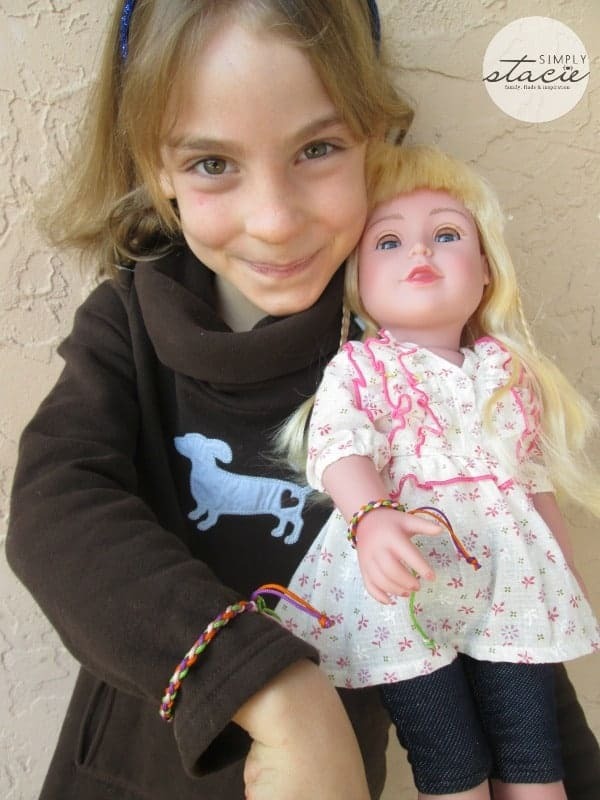 She and her new doll quickly became inseparable “best friends forever”. In fact, they even wear their own matching friendship bracelets as a symbol of being BFF’s and loves this unique feature. My husband and I are careful about making sure that any of Hannah’s dolls are dressed and styled in an age appropriate manner for young girls. The Alyssa doll fits that perfectly with very stylish yet modest clothing, accessories and features. Hannah loves to style her doll’s hair by combing it straight, using hair accessories and she has even practiced braiding it. We love that it doesn’t tangle easily and she has fun showing off the new styles. The facial expressions on this doll, especially her stunning eyes which open and close are just gorgeous and Hannah likes that her arms/legs are moveable. Hannah also loves to change Alyssa’s wardrobe and she thinks the Cool Weather 4 doll outfit set (SRP $24.99) is very fashionable. 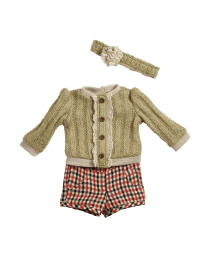 It features a stylish sweater, shorts and a matching headband. There are lots of other great doll outfits available too including a few of our favorites such as the Pink Fringe Open Toe Sandals ($11.99), Sports Ballet set ($29.99) and the Snow Bunny collection. Hannah has her eye on several of these outfits and is actually saving up all of her allowance over a period of time so that she can purchase a few more for her “best friend”g, Alyssa to wear. Alyssa has other Adora Friends dolls that can also join in on the fun including Kayla, Mia, Jasmine and Lola. Little girls can choose from different ethnicities, hair color and skin tones to find just the perfect new doll friends. As a mother on a budget, I want to make sure that whenever I purchase a new toy for my children that I am getting the biggest bang for my buck. I am consistently impressed with the quality, attractive pricing and attention to detail in every single doll or accessory in our Adora collection from Charisma brands. Adora dolls are award-winning and proudly made in the U.S.A. with many of the dolls handmade by talented artisans who have perfected the craft. These are dolls that are made to be played with and yet they still have that heirloom quality that means these dolls could be passed from generation to generation. As I watched my dear daughter fall asleep at night with her best friend tugged in by her side, I know that we made the right choice selecting Alyssa from the Adora Friends collection! You are invited to visit Adora Dolls to browse the entire selection of baby dolls, dolls and doll accessories. There are lots of great dolls to choose from for children of all ages. Which Adora doll or doll outfit would your child love the most? Would your child love to be selected as the 2014 Adora Young Designer? You won’t want to miss the Adora “Designed by Kids FOR Kids” program which allows one young designer to help their creative team make an outfit for one of the 18” dolls. This winning design will actually be manufactured and sold by Adora…how awesome is that! Plus, the Young Designer will be able to have a financial donation to the charity of their choice too! Hannah is already starting to brainstorm design ideas for Alyssa’s new outfit!